To walk the sidewalks with two fifteen year old girls, my daughter and her friend, is to see a London I hadn’t experienced: endlessly interesting in its outdoor life, spread out, shimmering hot, bustling and attractive, a city through sunglasses, an endlessly sunny asphalt summer of tube stops and clothes-shopping, gelato and south Asian hawkers selling tee-shirts saying “keep calm and carry on and mind the zombies”. The girls look older than they are. They fit in well, even better than I thought they would. “I could live here,” says my daughter, looking around as if appraising an apartment. “It would be easy”. I realize I’m taking what she says seriously. London has become cosmopolitan. With their blond hair and leggings the two girls could be British Poles out after work, or French shoppers, or the North American tourists we are. Famished, we stop at a restaurant in Soho. I’m feeling poor and was thinking something simple and therefore cheap. Once we’re seated I have a good view of the two chefs behind the counter of the open kitchen, joking with their sous-chefs as they hack at lobsters or lay out oysters, their casual chic and the line-up that gathers on the sidewalk both guarantees the bill won’t be what I had hoped. “How about fish and chips?” I ask the girls. The waiter, a dark-eyed, powerfully-chested Brazilian in fitted white dress shirt and black pants, is hanging by our table, chatting them up while I peruse the menu. I have a brother who moved to Calgary, he tells them. Your country is paradise. He kept phoning to tell me in the first few months to tell me that. Then winter arrived, he came home to Brazil. Canadians are wonderful, the waiter concludes, spreading his arms wide as if welcoming us in. The weather, not so much. There is a warm glow surrounding the girls that extends somehow to me. Londoners think they are sisters, perhaps fraternal twins. I catch passers-by smiling at me, the dad, hovering behind or more often forging ahead, wrinkled brow, studying the map on a streetcorner, finding our way through the city where there are no parallel ways and the names change by whim. 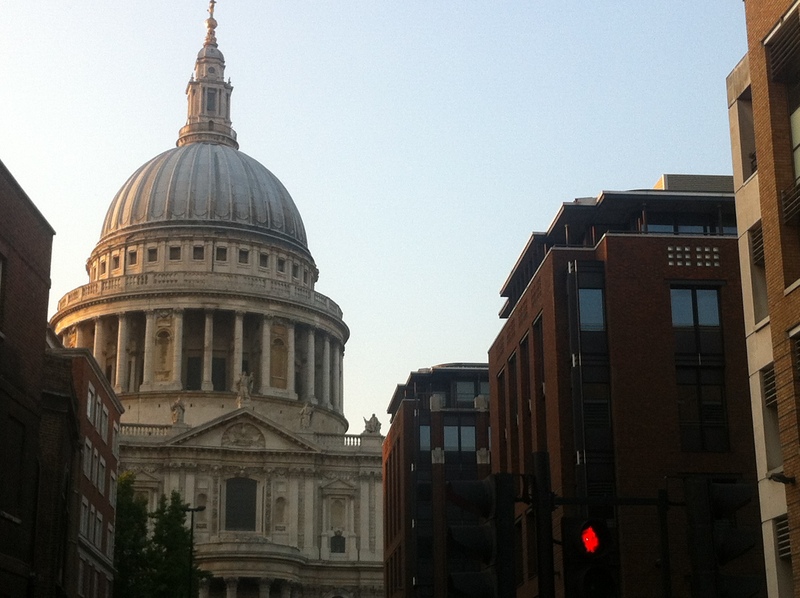 We go to St Paul’s Cathedral. On entering the narthex I feel myself relax; I’m on familiar ground. But after a few minutes admiring Christopher Wren’s dome, I’m already annoyed at the awkward theology and evangelicalism of the Dean’s comments on the iPhone guide we’ve been provided. He sounds like a tour guide who’s being surreptitious in trying to get a few words in about faith. A full flow of tourists shuffle by as I listen and look. I’m poked in the back. The girls, sitting behind me, have negotiated the full menu of the device and are ready to go. I realise I’d prefer to see the living congregation. Maybe Quebec has made me more Catholic; I miss the banks of candles and the side altars of Notre Dame Paris, and look in vain on the edges of the huge space for a black-albed sexton or a deacon or anyone churchy with whom to identify. The girls fidget. We join the crowds again, and finally, in the sparkling gold and blue mosaics of birds, high above the quire, I feel something of whatever it was I was looking for. Then, in the crypt, there is another bonus: a memorial to William Blake. I wonder what fantastical images he might have produced, looking at us now, with our cameras, lined up at the gift shop, calling out to each other in every language under the sun. Making sacred the commonplace is a mystic’s art, but all it takes is a lack of attention, it seems, to make the sacred commonplace. We exit the church into more of the brilliant sunlight the Londoners are calling “a summer to remember”. A man in a shirt and tie, jacket in hand, slows slightly to step off the sidewalk around us. He catches my eye and smiles. “Brilliant isn’t it?” he says and I don’t know if he’s talking about the day or being a dad walking the streets with two such teenage girls.